A kitchen is where the homeowner can realize the biggest return on their investment. While you live there, a beautifully designed custom kitchen can become the heart of your home. When thinking about what type of kitchen cabinets to feature in your Philadelphia home, take a look at our cabinet doors and cabinet finishes. Kitchen remodeling represents a tremendous investment and has a huge impact on the actual appearance of the room. At the same time, it can also give you the largest return on investment should you ever choose to sell your home. 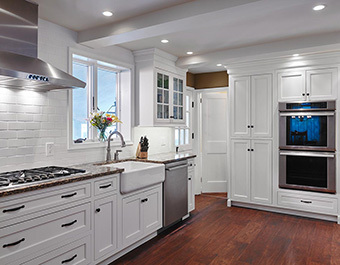 The wide variety of materials and styles available today make it simple for homeowners to choose the cabinet styles that will be most complementary. When you’re selecting modern kitchen cabinets, consider the reason for making the upgrade. Do you have antique heirloom dishware you’d like to display? Is one member of your family an avid cook? Do you have certain food needs that would warrant custom kitchen cabinets? These questions can help you make the right decision for your family’s needs. If you are looking for modern kitchen cabinets in Philadelphia, you’ve come to the right place. Our custom cabinet makers can help you achieve the look you desire using high-quality finishes and woods. 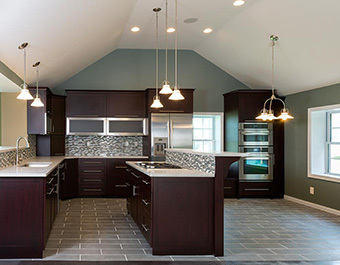 Whatever your needs, Custom Cabinetry Unlimited, LLC can help. Our company understands the need for a kitchen that is functional, yet pleasing to the eye. Kitchens provide a place in the home to gather together to cook and to eat. Over time, kitchens often lose their functionality and can become outdated in certain ways. If you feel that your kitchen could be more modern in appearance, you’ve come to the right place. Custom Cabinetry Unlimited can help you re-invigorate your kitchen and make it a vital, vibrant place once again. Our custom kitchen cabinet remodel job will leave you amazed at how you ever lived before the job was done. Your kitchen will feel fresher and more spacious, making it easier to get things accomplished. You can trust our company to provide you with high end, custom kitchen cabinets including full-access frameless cabinetry. Our expert finishing department can develop any look you desire from antique to distressed to traditional. The ability to customize your kitchen remodeling project enables you to choose from a wide variety of materials. These include alder, maple, cherry and more exotic woods such as African mahogany and quarter-sawn oak. You can also choose from various countertop solutions when doing a kitchen cabinet remodel. These include laminate, granite and engineered stone. When you choose Custom Cabinetry Unlimited, you will have access to our knowledge in helping to make a good decision. When thinking about a kitchen cabinet remodel, we are a trusted name and will ensure that your project is a success. What would you like to see in your kitchen? At Custom Cabinetry Unlimited we build islands, message centers, beverage centers, wine storage spaces, and other custom cabinets. If you are considering upgrading your kitchen cabinets, think what is practical for your space and what will fit your lifestyle. For instance, do you have the space for an island? Ideally you should have 42” between an island and an adjacent work space. As you design your kitchen, don’t forget to accommodate the kitchen triangle. You should be able to draw a straight line from the center of the sink to the range or cook top and back to the refrigerator for the most efficient and functional work space. We are ready to hear the vision and design ideas that you have for your custom kitchen cabinets in Philadelphia. Contact us today to get started!